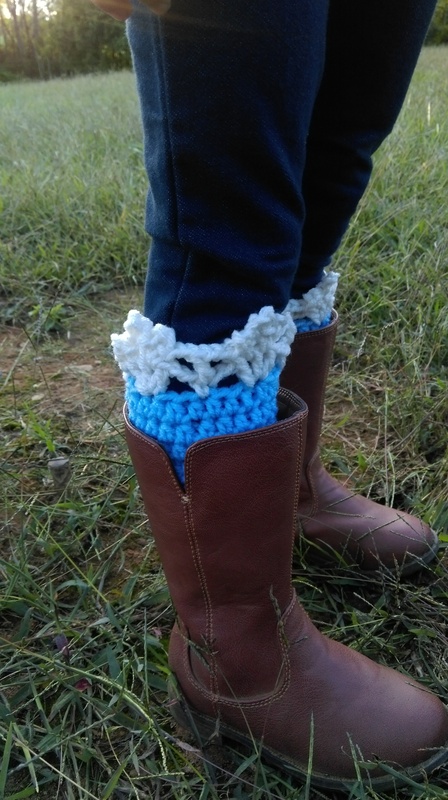 When I was working on the Snowflake Boot Cuff Crochet Pattern design, I decided that I wanted something a little out of the ordinary. As I sat down to work, my daughter sang along with Disney’s Frozen. I instantly knew what I wanted to do. I ran upstairs and grabbed my brightest white yarn. When I was finished, I knew I’d been successful. 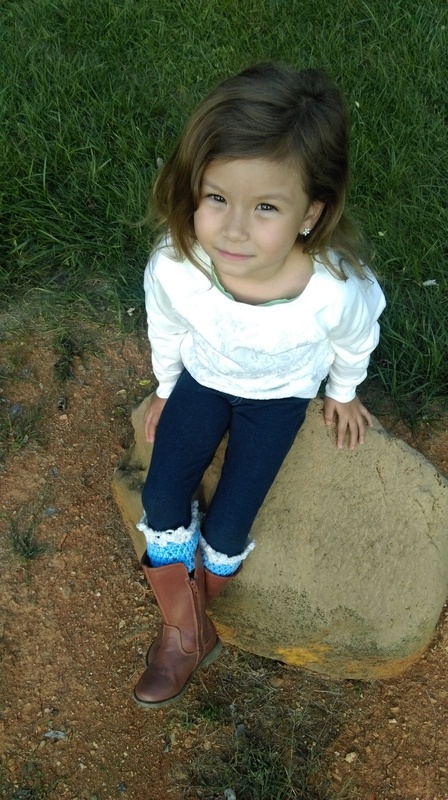 My daughter looked wouldn’t take them off all day because, “I feel like Elsa,” she proclaimed. This was probably one our best ever photo shoots, and I just wish I could put all one hundred pictures on this post. 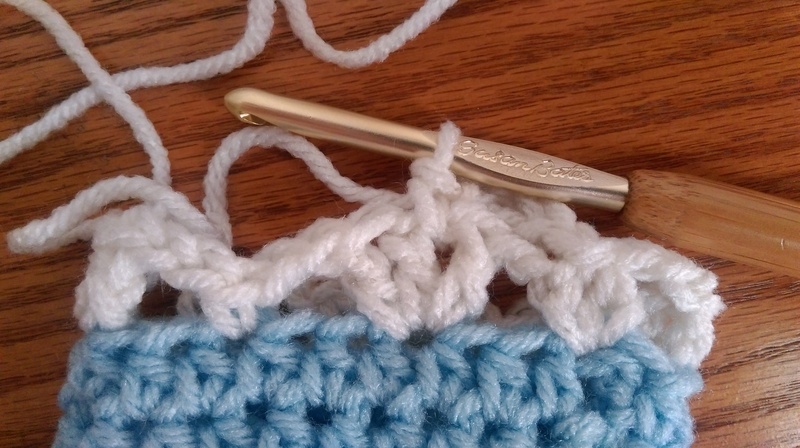 This pattern is written in US crochet terms. Gauge is not completely necessary for this pattern. One size will fit most children between 6 months and 5T. 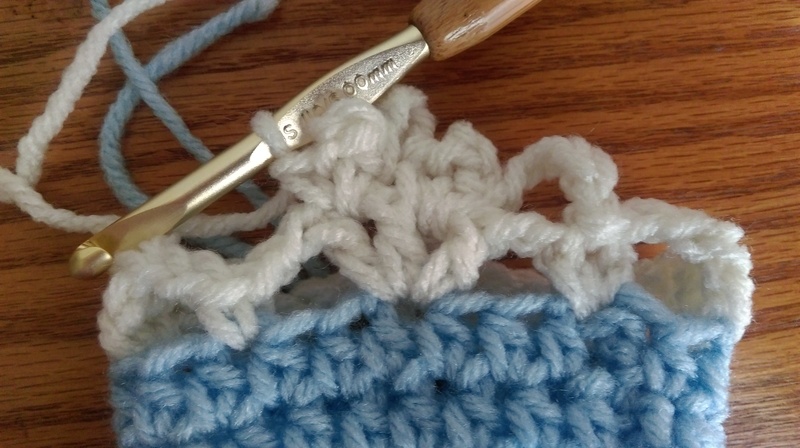 To increase or decrease the size, you may add or subtract six chains and hdcs wherever counts are noted to have enough stitches for the edging. You can change the way the rounds are joined and started to fit your preference. Some may choose to use an invisible or slanted joining method. 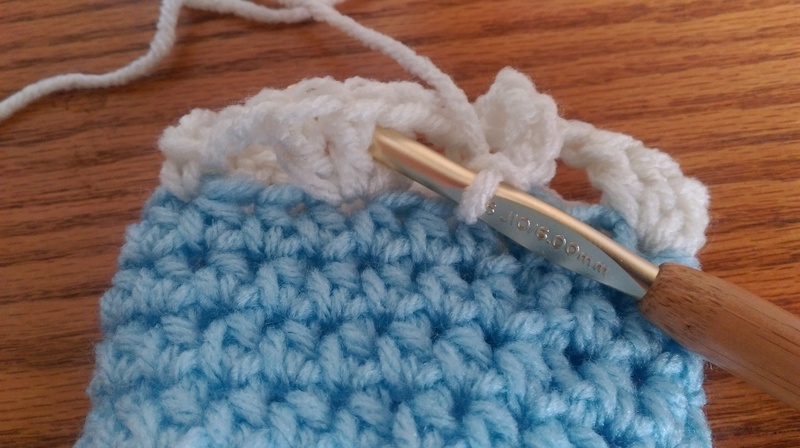 You could also continue in rounds without using a slip stitch as long as your last round has a count divisible by six for the edging, IE: 18, 24, 30, etc. You may use whatever colors you prefer or have on hand. 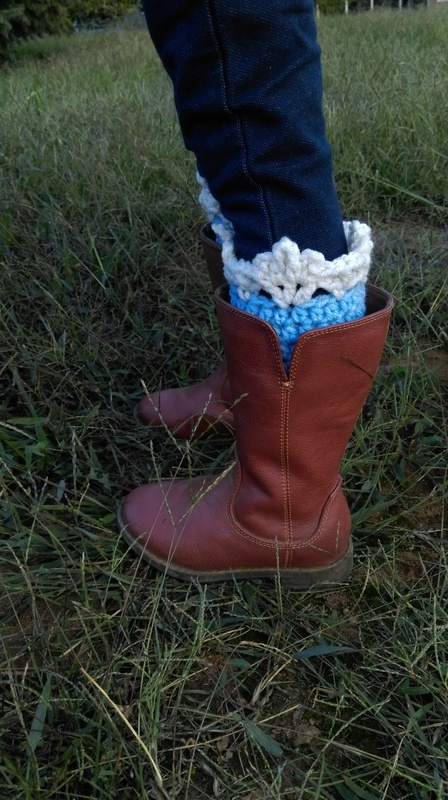 This pattern is great for using up any scraps you might have in your stash. 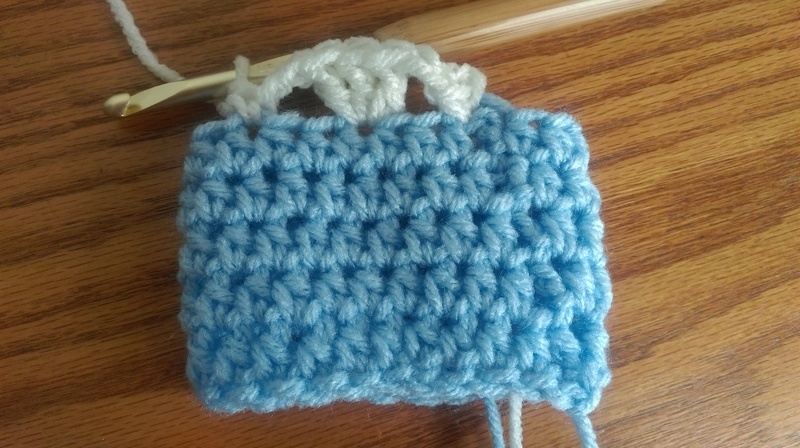 If you have any questions while completing this pattern, please feel free to email me at clrinaldi1989@gmail.com. Round 1: With blue, ch 24, join with sl st in first ch, ch 2 (counts as first hdc), hdc in each ch around, join with sl st in top of first hdc (24 hdc). Round 2-5: Ch 2 (counts as first hdc), hdc in each hdc around, sl st in top of first hdc (24 hdc). Fasten off blue and join with white in first hdc. Round 6: Ch 1, sc in same st, *ch 2, sk next 2 hdc, 3 dc in next hdc, ch 2, sk next 2 hdc, sc in next hdc, reapeat from * around, join with a sl st in first sc. See figure 1. Round 7: Ch 5 (counts as first dc, ch 2), *(sc, ch 3, sc) in sp between first and second dc (see figures 2 and 3), ch 5, (sc, ch 3, sc) in sp between second and third dc (see figure 4), ch 2, dc in next sc, ch 2, repeat from * around, join with a sl st in first dc (third ch from beginning ch 5) fasten off. Weave in all ends with yarn needle.